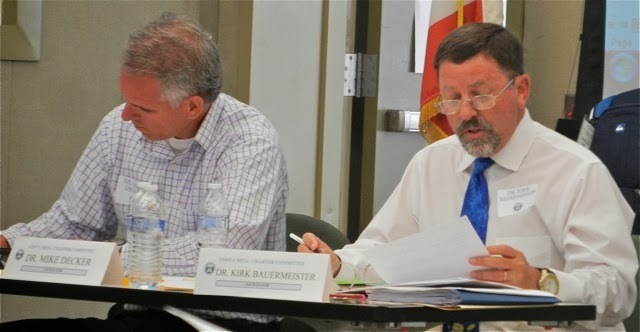 Attending yet another meeting of the Costa Mesa Charter Committee, the group appointed by the City Council to prepare a charter whether we need one or not, was another very frustrating experience. I'd missed the last two, so I had to re-acquaint myself with the ponderously slow pace that this group takes as it slogs its way toward the creation of a document for the City Council to consider some time next year. As you can see, this includes language rejecting the payment of so-called "Prevailing Wages", the text of which was finally agreed upon at the last meeting. 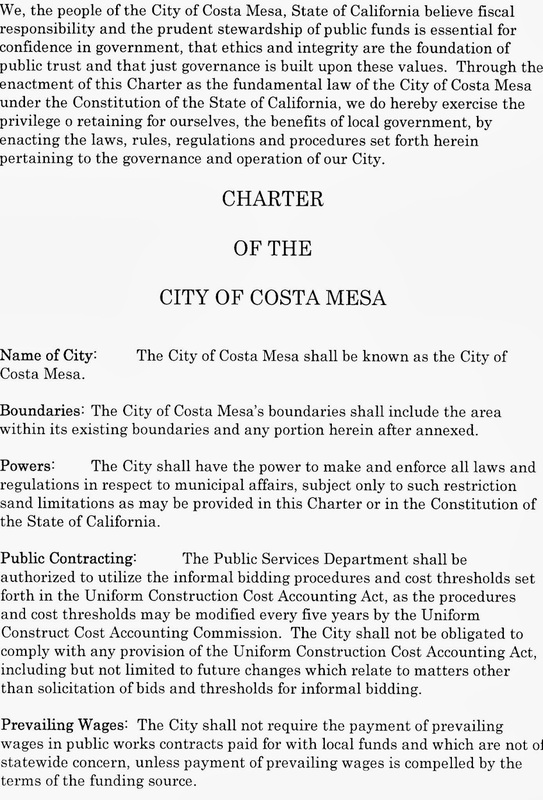 During the meeting last night there was a short discussion about the need for this language in light of recently-passed Senate Bill 7, which changes the rules regarding Prevailing Wages and imposes severe penalties for Charter cities that fail to comply. The committee decided to just leave the language in until they see if there will be a legal challenge to SB 7. The issue of City Council Compensation was discussed at length, but no real decision was made. That conversation will continue at the next meeting in November. Opinions varied widely as the group kicked it around, ranging from some who thought they should be paid nothing to those who thought they should be paid more. Some thought they should have no pension while others disagreed. Funny, nobody mentioned that a previous council approved a pay cut, which remains in effect today. Each council member currently makes $904.40 per month, plus amounts for Medical and Pensions added to that number. Nobody expressed what they thought the council SHOULD make, though. Near the end of the meeting the group began discussing Unfunded Pension Liabilities, laying the groundwork for a thorough discussion at the next meeting. Presently they have insufficient information to proceed. Members want specifics about the actual scope of the unfunded liability issue. Following that discussion the plan now is to wait for the Pension Oversight Committee to hear a presentation by a representative of CalPERS within the next couple weeks, then have the Finance Director and, perhaps, the Chair of that committee, make presentations to the Charter Committee. It's likely those presentations will take place in their December meeting. Because of holiday scheduling they will only meet twice more before the end of the year. Don't get me wrong when I complain about the pace of these meetings. From the beginning the committee chose the methodology and are sticking with it. I think most of the members arrive prepared to do the work, although a few clearly have not done their homework before the meeting. That leads to some bizarre discussions in which the conversations seem to go round and round in a never-ending circle. And, one or two of the members seem to be in an almost perpetual state of confusion. They chose to put the tough issues up front, so it's likely that progress will come more quickly as they move into theoretically less controversial issues over the next few months. We'll see. Among the questions asked late in the meeting was one that dealt with the schedule they are on. Members wanted to know when they had to have their work product ready for the City Council to consider in order to get it on the November, 2014 ballot. Although no definitive answer was given, Attorney Kim Barlow did say that it must be ready for submission no later than 95 days before the election, which would mean the end of July next year. Prior to that, though, there are two public hearings that are required, which backs it up further. Based on the way the last Charter scheme was handled, it's likely that this group will have to get their job done by February or March to make the ballot next year. The pace that is being followed makes that time frame very tenuous. The committee meets next on November 13th and then on December 11th. We'll be keeping our fingers crossed that progress will be made by then. I'm sure they'll be able to "throw something together" but that really doesn't bode well. It isn't like its really going to be considered anyway. There is no getting around the new bill, so as previously stated by many, there is no need now for a charter, except to allow Riggy to say that "he did it". I am not willing to submit myself to a charter simply for his edification. Sorry, but NO! When do campaign contributions get addressed or are they ignoring that? What is the Medical Ins. compensation? I hear it's about $1,500 a month....Gary, care to chime in? If correct, that's pretty good for a part time gig, eh? apyrac 91You can look on the City web site for the pay and benefits, although I was surprised to read in a newspaper article that the City Council have vested pension plans after five years. I did56 not find that on the City web site. May be there and I did not notice it. MESA water District and The Sanitary District pay and benefits are on their web sites also. 95 days prior to 4 November puts us at 1 August, the drop-dead date for submission. I move we hire Julie Folcik back. Maybe she could work her magic again.